How much of your search traffic is for your brand and how much is for generic terms? Generally, between 25% and 50% of all traffic to retail (e-commerce) websites is via search engines (& the majority of that is from Google). At the same time, merchants spend a large amount of budget on search engine optimisation (SEO) or if not, worry about it. I would contend that brand-related traffic (e.g. your company or brand name) is traffic you should be getting anyway and your SEO should not be claiming credit for it – your SEO should be paid on that long tail of “generic” search terms, such as “hoodie”, “fillet steak” or “bluetooth speaker”. However, the visibility of what search keywords work and what doesn’t is dipping well below 25% – a quick glance at all those (not provided)s in Google Analytics will horrify you! How is it possible to determine the economic viability of this investment? This article will help you with an heuristic approach to extrapolating some answers from what little data you can see in Google Analytics. [Whilst not necessarily accurate, it will provide a meaningful and importantly, quick, steer in the right direction]. Open your Google Analytics and visit the report called “Keywords/Organic Search”. Write down the total % of overall traffic and the revenue it generates. Write down then the % of (not provided) keywords from this value as well as the revenue; then subtract this from the total to derive the amount and value of traffic that is known. The next challenge is to compute the amount of traffic (& value) associated with your brand. Because of all the variants people use to identify you (correct or not), the trick is to identify a minimal character sequence that would identify a Google search for your company/brand and which also implies they know of you. Some experimentation and review may be required. Write down the amount of traffic and its revenue which is now deemed to be “known” and for brand-related search terms. It’s also useful to make of the conversion ratio of this. If you want the conversion ratio of generic searches, you’ll have to filter out (not provided) and brand-related searches for a true reflection. It’s usually the case that this traffic (though costly and hard-won) does not convert as well – making the economic case even harder. In your spreadsheet, you can now divide the (not provided) up into two pots: brand and generic, using the % split for what is known. If 45% of your known traffic is for your brand, it’s a reasonable contention that 45% of your (not provided) traffic is for your brand. Now you know the amount of traffic for generic searches and its value (as well as it’s conversion ratio). On average, according to data collected across 15 B2C retail sites, it is 15% of all traffic and converts at one quarter the rate of brand-related searches. 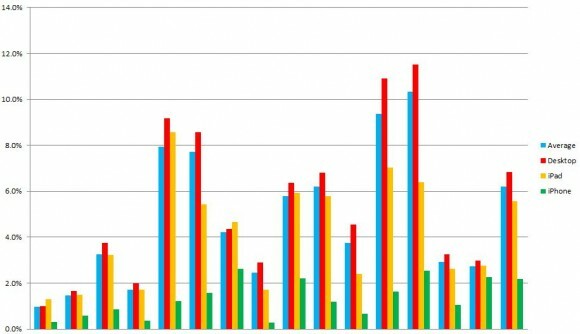 See a statistical breakdown of different types of search traffic and its conversion – see this article. 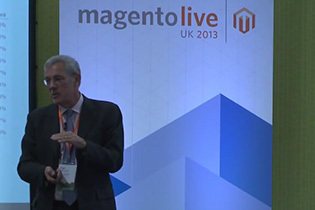 Roger Willcocks spoke recently at Magento Live 2013, in London. The talk discussed how retailers should go about using Google Analytics to measure site sales and conversion performance. Magento’s own summary reads thus: “Screen Pages’ Roger Wilcocks offered practical advice on tracking key metrics and shared insightful benchmarks across 100+ stores. Key takeaways include focusing your plan around the behaviors that influence conversion, keeping a keen eye on what makes for a good proposition, as well as planning out your improvements with metric targets. At the end of the day, It’s all about measurement and refinement. We were prompted to further investigate the role of mobiles in our study of Xmas online traffic. Mobile skews the numbers, it appears. Looking at the average conversion ratio for a collection of websites during the period 1st-15th December, we can see a healthy 4.81% conversion rate across 16 selected websites. However: a lot of the traffic comes from mobile devices – per Google Analytics. That’s 13.3% from iPads and 6.9% from iPhones (excluding the all the other small-screen devices categorised as “mobile” by Google. In average terms, the conversion ratio from desktops was 5.41% – 0.6% higher than the overall average. That’s about 10% (imagine that % as an increase in your sales). iPads (despite popular reports) convert less well than desktops at 4.16% (and this is true in all but two of the websites sampled), and 43% had websites where iPads performed better than the website average . iPhones obviously bring up the rear with 1.3% – only a quarter as effective as desktops. Moral: it pays to break out the devices as the range of behaviours is broad and the overall averages may not yield the “correct” answers. Timely summary Google about how to link your Webmaster tools account to Google Analytics. This means that in one place you can see a summary of your website’s SEO performance directly from your Google Analytics account. Amusing video from the Google Analytics team highlighting critical points in the e-commerce checkout process: highlighting all those irritating niggles about delivery, registration, anti-spam checking etc that would cause a customer to exit. The full Google post is here.